How to Deal with Abandoned Carts in Magento? Shopping cart abandonment is one of the biggest challenges ecommerce businesses face. There’s nothing more disappointing for a retailer than to lose a customer who is about to complete a purchase. 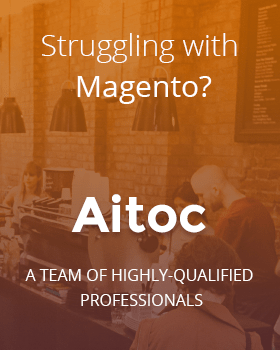 In this post Aitoc provides you with 10 tips to fight abandoned carts in your Magento store and make customers come back. Without exaggeration, abandoned shopping carts are an ecommerce nightmare. You have a modern, eye-catching and user-friendly webstore, and your product offering is irresistibly attractive, but some of your customers leave at the very last minute. They choose the items they want, add them to the basket, and… never finish the transaction. According to Statista, one of the leading market research companies, 77.3% of online retail orders were abandoned as for the second quarter of 2017. Just imagine, you lose 2 out of 3 customers coming to your store! The reasons for that may be numerous. Hidden shipping costs, lack of detailed product information, a long checkout process, uncertainty and many others. Customers may also find a cheaper alternative or just be distracted by an unexpected phone call. All that together affects their decision-making, ultimately leaving you with no profit. 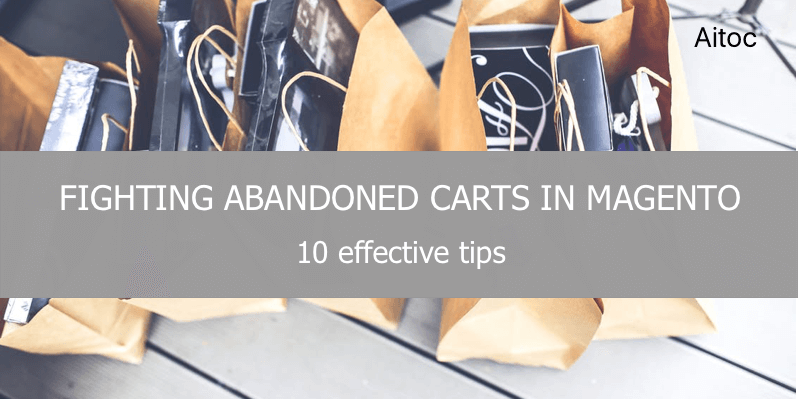 Want to reduce the number of abandoned carts? Here are 10 useful tips that will help you do that. A complex checkout flow is definitely not something your customers want to deal with. Provide them with a hassle-free experience by cutting the whole process to 3-5 easy steps. Think out carefully what information is vital for order placement, and create a set of simple forms to be filled in. The shorter the checkout process is, the better. Shipping and delivery is yet another source of major concern for both customers and sellers. High shipping costs are one of the main reasons for cart abandonment. With all special deals and offers available at stores today, customers expect free shipping on literally every order. So there is a good chance that your competitors outperform you just because they offer free delivery, whilst you don’t. Adding extra fees at the end of the checkout is unfair to your customers. Nobody wants to feel deceived. So make sure the product price and any extra costs, including shipping, are displayed clearly on the product page. You may think that a higher price will prevent customers from adding products to cart, but not in this case. Your buyers will appreciate it if you let them go through the checkout process with no surprises. “What you see is what you get” is a proven approach to successful selling. You might see the checkout process as an ultimate way to gather additional information about your target audience. However, lots of online shoppers get annoyed when they are forced to create an account. The ability to check out as a guest will help customers pass through the buying process a lot faster, and so will enhance the likelihood of a successful purchase. You can bring the shopping experience to a more personalized level by talking to customers throughout the checkout process. Short, casual phrases like “We’re about to finish” or “Almost done” encourage customers to proceed. Another great tool here is to include a progress indicator into the checkout page. This way site visitors can clearly understand what’s next and how long will it take to complete the purchase. Call to Action has proved to be one of the most popular and effective marketing tools. A store’s checkout page is a perfect place for a powerful CTA that would motivate customers to get the shopping done. Use clear, simple and friendly CTAs, keeping their messaging consistent throughout the entire process. “Continue”, “Get”, “Proceed” – test different word and color combinations to find out what works best for your target audience. It goes without saying, that if checkout pages are slow, your customers will slip away. According to the recent statistics, conversion rates fall 7% with every second of delay. You don’t want to test your customers’ patience, so you have to optimize page load times at the earliest. Some of the basic things you can do here are to reduce the page size, compress data, use progressive JPEG or PNG images, and limit the number of social plugins. Consider using a content delivery network and fast hosting services as well. A great variety of payment methods is available today, so limiting customers to only one option can turn them away. Credit and debit cards, PayPal, Amazon Pay, or Stripe – the list is endless. Offer the options that are most common within your business niche to provide your customers with exactly what they expect. Moreover, mobile payment systems are about to dominate the market, especially among the younger audience. So you might consider methods like Apple Pay and Google wallet too. In the course of the checkout process, customers may have questions or concerns regarding the product itself, shipment terms, or warranty. Lack of customer support service in this case may be fatal. Instant support options like an online chat or phone support, will help your customers resolve the issues they have, and so contribute to their decision to buy. One way or another, cart abandonment is inevitable for ecommerce. But we will share a secret tip with you. The best way to fight against abandoned carts is actually to recover them. And email marketing works perfectly for such a case. Often customers leave their carts because of the reasons beyond their control. Remind them about their initial intention with targeted follow-up emails to motivate them to come back and complete the purchase. Abandoned Cart Emails Pro for Magento can help you do that with no effort. Just choose an email template, customize it as per your needs and configure basic settings. Voila! Your emails will be sent out automatically to the customers who left without a purchase. Our extension will support your sales recovery strategy, allowing to create an effective email campaign that works for you and your customers.